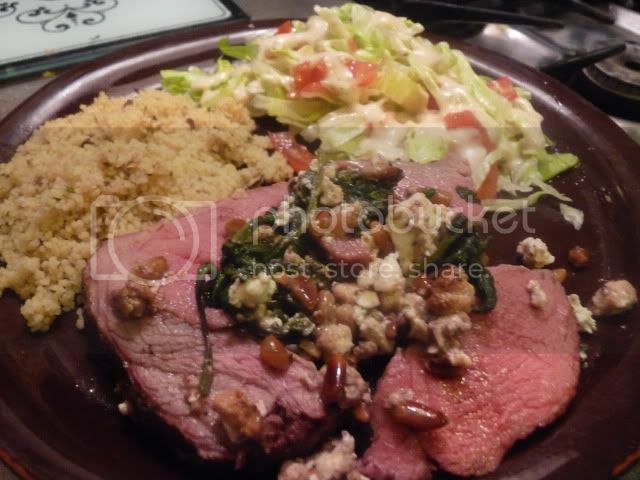 As I said yesterday, my wife had found a leg of lamb in the freezer that I had stashed in there after Easter and she wanted to try it out. 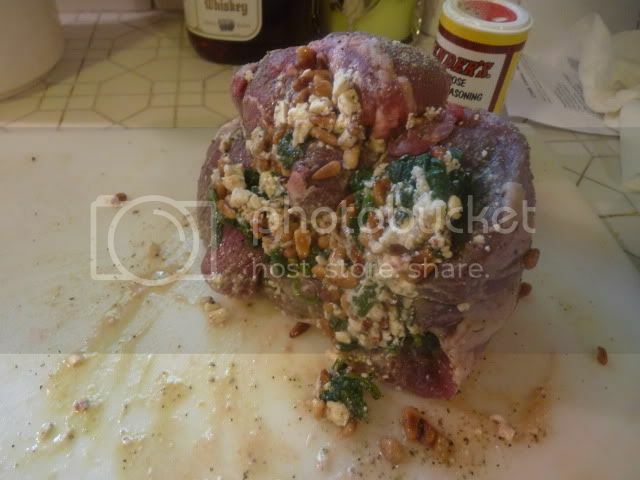 After much research and suggestions, I decided on following The Nakid Whiz's recipe for stuffed leg of lamb with spinach, tomato basil feta cheese and toasted pine nuts. The wife caught some shots of me in action. Rolling it up, this part was messy and I didn't do such a great job. Think I had too much stuffing going on. The recipe did call for DP Tsunami Spin, but since I don't have any, I subbed in Cavendar's Greek seasoning. Told you it was messy. Onto the egg at 350 direct with a raised grate and some apple wood chips for a hint of smokey flavor. I didn't pay any attention to time. I forgot to look at a clock when I put it on, so I have no idea how long it took. When my Thermapen registered 135, I pulled it off and let it rest. Here it is sliced up, nice and medium rare. Plated up with some mushroom couscous and a little salad. Had a nice glass of red wine to go along with it as well. The wife and I thought this was a big hit. I think next time I might let it go a little bit longer and if I use Cavendar's again, I think I would apply a bit more as I really couldn't taste it. 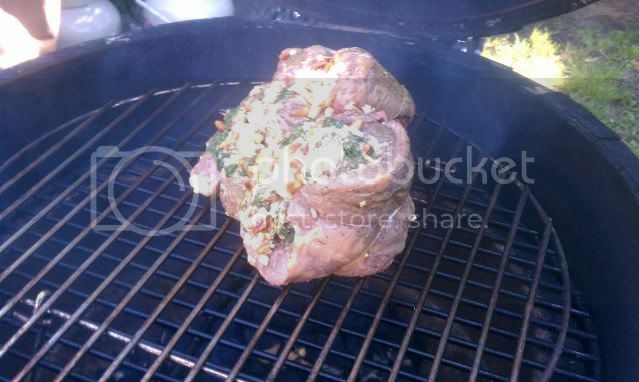 I think I would also use a bigger leg of lamb. This one was only 2.1 lbs and it made it kind of challenging trying to stuff it and roll it up. Might have been better to cut it into pieces and grill it up another way, but we wanted to try this recipe. We will definitely do it again and have people over. Kinda has that "Wow" factor that would impress. Thanks for looking and a big thanks to The Nakid Whiz! Nice cook. That definitely has that "wow" factor. My wife has been bugging me about trying lamb on the egg. Will have to give in soon. Looking good ! Want to invite me over for your next round ??!? 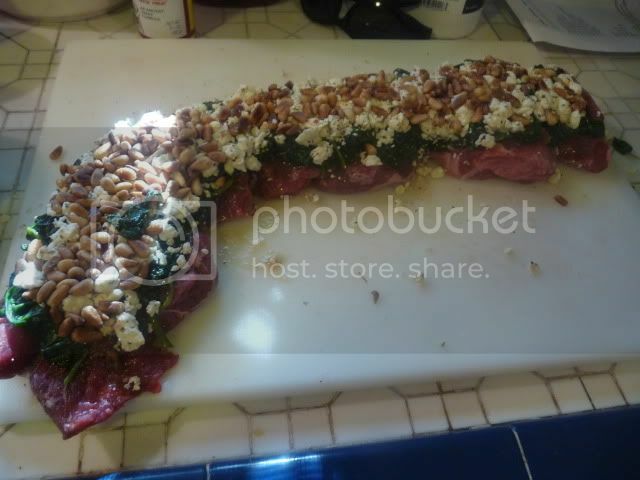 :blink: :laugh: Those stuffing ingredients sound awesome. I am not any good at "stuffing" / rolling type recipes usually either. My motto: The messier it is, the better it tastes. Applies to ribs & stuffed lamb & all kinds of foods. That's a wierd looking leg, lol! My leg was 4 pounds, but as you can see in my photos, it wasn't long and narrow like that. Not to worry though about being messy. Mine made a mess too. Better to have stuffing falling out than not having enough to begin with. But nice job! RaleighGuy, Mr Holloway - Go ahead and try it. It's really flavorful. LoisLane - come on over, but its quite a drive from GA to TX. TNW - thanks. That means a lot coming from a pro like you. You inspired me on this cook and I wanted to do it and you justice by doing my best. 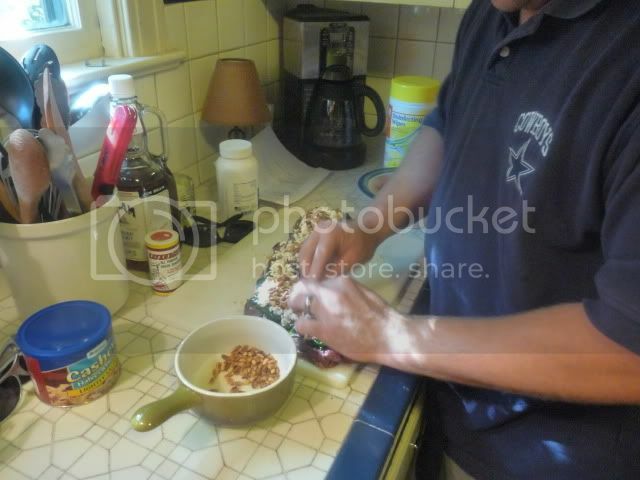 You are right, better to make a mess than not have enough stuffing. I did this cook yesterday and everybody loved it! Sorry, no pics this time around. Bump from 2011...but it looks great! No mention of the Jim Beam on kitchen counter. Could that be the reason he didn't know what time he put it on. Wow. Forgot about that post. That brought back some memories. We don't even live in that house anymore. That was a pre-Griffin's Grub post. Back then I didn't pay as much attention to time or other small details. Or it could have been the Jim Beam as @burr_baby33 suggested. Mmmmmm that lamb looks just the way I like it. 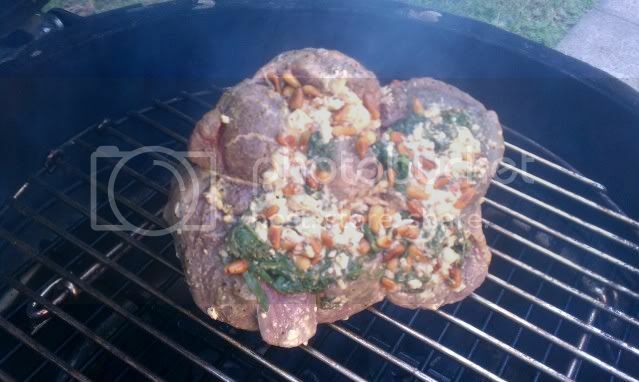 I have been doing so many different things on the Egg, that I just plain haven't gotten around to doing a roast lamb. After looking at these pictures I shall have to correct that oversight. I had breakfast before I came here and I am still hungry after seeing those pix. If I may what is the purpose of doing that direct with the grid raised? Looks great Griffin. 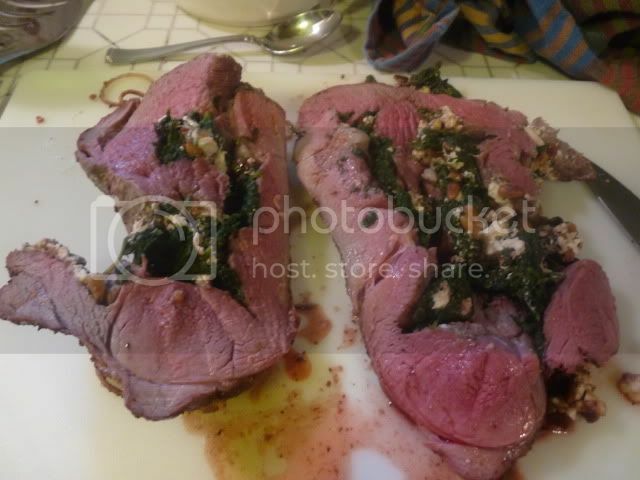 Lamb is something I haven't messed around with too much.